Photographing grand exits at weddings is my second most favorite wedding event to cover, right after first looks. The photos are always adorable, and it ends the night with a bang. However, a little planning goes a long way to help make your final farewell go off without a hitch. As you’re planning what to do for your exit, check with your venue to see if they have any restrictions. Some do not allow sparklers, while others despise confetti (can you blame them?). Have a few ideas in mind to avoid disappointment. If you're dream is to incorporate a firework show or floating lanterns, be sure to ask your local fire department about fire danger levels in the area as well. If you don't have a wedding planner, be sure to put someone in charge of getting everyone outside and set up, as well as getting your transportation in place. Have the person in charge check with the photographers to ensure they are set up and ready before telling you to go ahead and exit. TIP: If you choose to exit with sparklers, have candles nearby to make lighting quick and easy but do make sure they are not lit too early — you don’t want them to be extinguished by the time you get outside! As you can imagine, exits are a bit crazy to capture! Low light makes fast movement difficult to capture, so take your time walking down the aisle and stop in the middle of the tunnel for one last kiss. This gives your photographer a chance to get the perfect photo before you’re on the move again. As tempting as it may be to give lots of hugs and say one last goodbye before getting in your vehicle, when you’re swarmed by guests it makes it very hard to capture great imagery of your final farewell. Once you reach the getaway car, hop in and go! If you don’t have your photographer scheduled late into the evening, consider doing a staged exit. It doesn’t take many people to pull off, just your bridal party or a few family members would be enough. Then you fake an exit, sparklers, confetti, or bubbles in all! I think of this as a win/win. 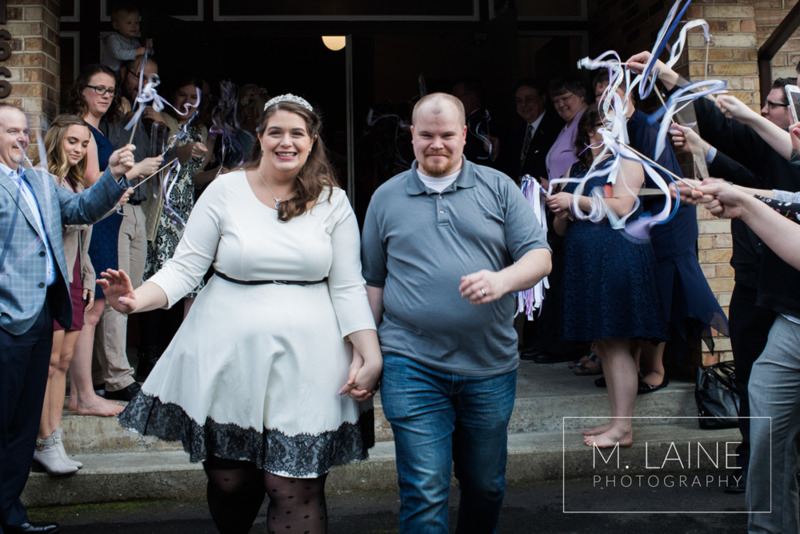 You get cute exit photos and don’t have to pay for a photographer all night. Use the image below to save this article to Pinterest.